Solar equipment refers to the devices and component which helps to harness the solar energy from sun. Solar equipment is environment friendly and helps in reducing carbon emission. Moreover, solar equipment is being increasingly used by developed nations to fight climate changes. The market is expected to expand at a robust CAGR during the forecast period of 2017-2024. Rising environmental and energy saving awareness is anticipated to drive the growth of solar equipment market. Further, the favorable government regulations and policies are expected to expand the global solar equipment market. Globally, North-America is projected to dominate the overall solar equipment market during the forecast period. 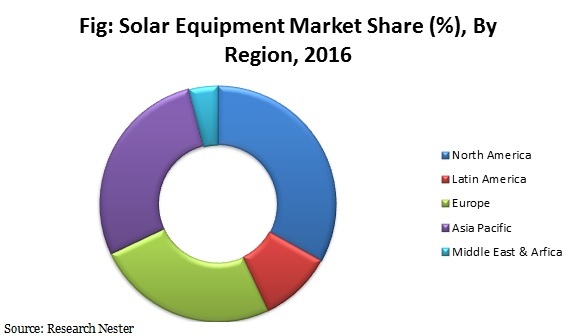 Increasing penetration of advanced and variety of solar equipment products in the region is expected to positively impact the growth of solar equipment market. Further, introduction of government regulation to harness solar energy and become energy independent is appealing and creating awareness among population to adopt solar equipment. Moreover, declining solar photovoltaic modules bodes well for the growth of solar equipment market in North America. Based on equipment, solar equipment market is segmented into solar panels, energy storage system, power meter and accessories. Further, solar panels accounted for the largest market share in overall solar equipment market in 2016. Factors related to environmental concern such as reducing carbon emission and increasing consumer awareness are driving the demand for solar equipment products. Further, clean energy products have various advantages over the traditional energy product such as renewable source of energy and others. These advantages are expected to bolster the market of solar equipment products. Rising demand for renewable energy products is one of the key factors which are fuelling the growth of solar equipment market. Further, the high adaptability and encouragement of environment friendly technologies in developed regions is one of the major factors which are uplifting the demand for solar equipment. New and advanced & high efficient solar equipment products are penetrating the market. Further, favorable government policies and program are resulting in increased expenditure on harnessing solar energy. In addition, government is also offering subsidies to promote solar energy. This factor is envisioned to bolster the growth of the market. Apart from this, growing adoption of solar equipment in industries is believed to fuel the growth of the market during the forecast period. However, pre-dominance of alternative sources of energy and high dependency on fossil fuels for energy is anticipated to restrict the growth of the solar equipment market. Moreover, operating limitations such as full operating capacity of only 4-5 hours is also believed to hamper the growth of the solar equipment market.